The Ping G15 irons feature a stainless steel head and a new Custom Tuning Port (CTP) that expands the perimeter weighing and increases the moment of inertia for added forgiveness and stability. Its wide-sole design positions the center of gravity lower and deeper to increase the launch angle for higher flying, longer carrying shots. 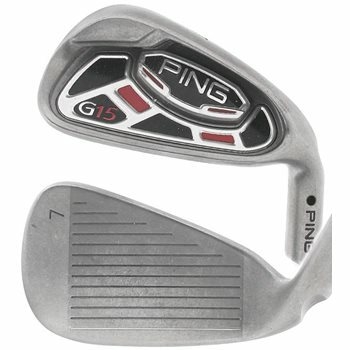 Its thin face design creates weight savings that are re-positioned to the toe for added forgiveness on off-center hits. There is a 6-PW & AW in graphite stiff shaft for $269.99 and a 5-PW, AW & SW in graphite stiff with white dot lie for 279.99. Each of those prices are before the automatic 10% off discount that will apply to the item in your shopping cart. The grips will be in playable condition. If they are not deemed in playable condition, we will replace them before they are shipped. There is not a way for us to list the type of grips on every golf club and set as we ship from multiple locations and could have more than one of the same item. Our shipping department will simply pick the item on top and process the shipment.